This then & now pair shows the old Post Office building on the corner of Barrow Road and Warwick Road in 1969, shortly before its demolition, taken by John Drew for his book Kenilworth – A Manor of The King (Pleasaunce Press, 1971). According to Victorian Kenilworth and Its People (Rookfield Publications, 2006) by Robin Leach, the original Kenilworth Post Office depot was in the Coventry Cross in New Street, but it subsequently moved to premises across the road at Number 3, New Street by 1861. In 1885 it moved to share a premises with the Leamington Priors Bank in the High Street, on the site of the old house known as The Priory. KHAS Newsletter 29 from 1968 tells us of a talk Joyce Powell gave to members KHAS on the site: “On April 27th 1885, the Leamington Priors Bank bought the whole property for £1300. They pulled down No 11 and demolished the entire High Street frontage of No 13, but left the 1770 South block with its staircase intact. The back wall of the present Bank seems to be the old South wall of the earlier house. The rebuilding produced two imposing twin offices, one intended for the Bank, and the other to re-house the Post Office. The Postmaster, Mr T S Morris, moved into a rebuilt No 11 as Postmaster and Bank Manager, and The Priory was then let to Major Boileau as a private residence”. By 1901 there are references to a sub-Post Office in Warwick Road, subordinate to the main Post Office on the High Street. Harry Sunley records in A Kenilworth Chronology (Odiborne Press, 1989) that crowds flocked to the Warwick Road sub-Post Office to receive confirmation of Queen Victoria’s death in January of that year. In 1912 he records that the main post office then moved from High Street to the present Barrow Road corner site. In 1954 the Post Office opened a new telephone exchange next door on Barrow Road, reusing the and extending the buildings of the former Youth Centre. 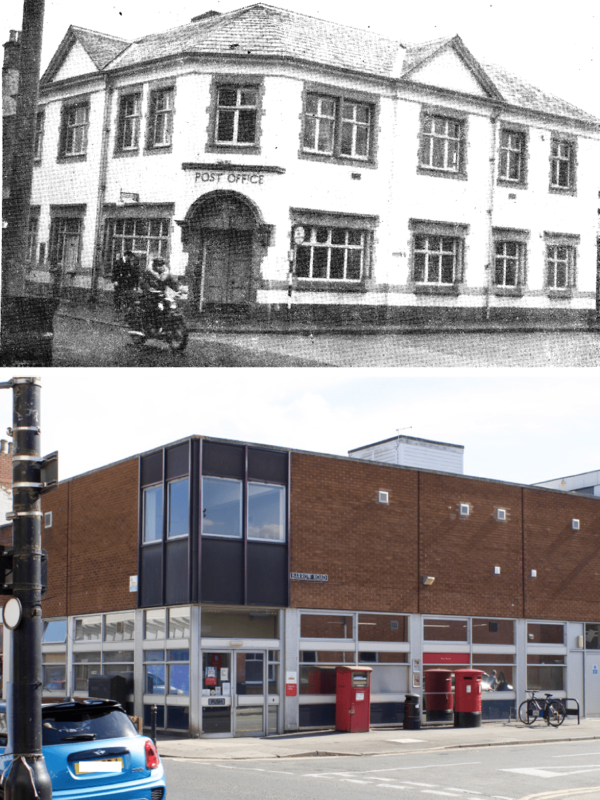 The old Barrow Road corner Post Office building was demolished in November 1969 and rebuilt in a modernist style. Robin adds that the new Post Office “…opened in January 1971, despite there being a postal strike on! The old sorting office behind the main building did not come down until afterwards”.